If you’ve never been Fall camping before we really believe you should at least try it once in your life before you cross it off your list. Many people claim it to be their favorite time of all to go camping and they tend to book more camping nights during the months of September and October than during the spring or summer. 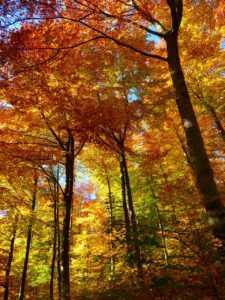 Fall camping is truly a time for contemplation and allowing yourself to be immersed in the breathless display that Mother Nature puts on in our beautiful woods of Ohio. The smell of Autumn leaves and the sound of them crunching under foot as you stroll the campground roads can make you feel comforted and calm. The summer crowds are gone and the days’ pace has slowed. It’s blue jeans and hoodie weather so you feel snuggled all day long. There are orchards to visit, cider to taste and pumpkins to carve. Conversations are deeper because people seem to have more time to talk. You can visit our area farm markets and take a hayride or purchase handmade crafts from locally sourced materials. Take your time and stroll through our museums, take the Fall Foliage Tour, or visit a winery. The days are getting shorter so you can make your way back to the campsite for a campfire under a cool and clear night’s sky. Fall camping offers you the emotional elbow-room you’ve been needing. You don’t have to feel rushed or that you need to entertain anyone. Your days can be spent exploring the area or buried in a good book. It’s entirely up to you. That’s the beauty of the season. It’s a winding down and everyone you meet is of the same mindset. They will be enjoying the Fall feeling as much as you are. Be sure to call us with the dates you’d like to arrive and we’ll be sure to have a nice spot waiting for you. We look forward to seeing you here at the campground this Fall. You really will be so glad you came.